Do you have kids or just like children's books in general? Consider joining in the Read Aloud Thursday Carnival which Amy hosts every week over at Hope is in the Word. This carnival is nicely coupled with Jennifer's (at Snapshot) Read Together Challenge so you might consider combining the two for a good reading time with your kid(s). 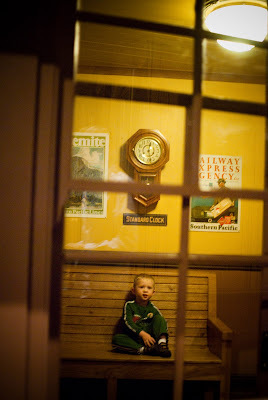 My son, who shall now be known as Bookworm1 on this site, is really into trains. REALLY into trains. Thomas and Friends anyone? Thomas, we love yoooou. 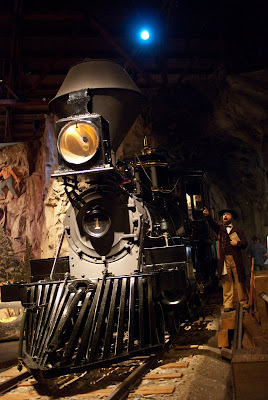 When we went on our most recently trip down to California, we went with our friends to the Railroad Museum in Sacramento. Have a train lover in your family and in the Sacramento area? Make it one of your official stops. That museum was AMAZING! On the tails of that, I thought it might be a good idea to go to the library and see if we could find some train books that were not Thomas related. I don't mind Thomas at all but I do like variety. I wasn't sure what Bookworm would think but it turns out he was more excited than I was about the new train books! We found All Aboard! which, of course, is fun to yell out. It's especially fun to yell out if you have a train whistle to accompany the yell. Which we do. Of course. In this picture book by Mary Lyn Ray, we meet the train at the station where a little girl and her stuffed rabbit, Mr. Barnes, climb aboard to travel overnight to go and visit her grandparents. I confess it took me a few minutes to figure out that Mr. Barnes was the stuffed animal. The storyline flips back and forth from the regular train traveler's adventures to the adventures of Mr. Barnes. I don't know whether the story made sense or not to my son but I thought it was somewhat confusing. That said, Bookworm1 did ask to read it again so I guess he enjoyed it! Trainstop , I didn't realize at the time I picked it up, is a picture book without words. I'm not a really big fan of books without words partially because I'm a bad storyteller. Nevertheless, I am happy to report that I rose to the challenge and added words and a story which my son seemed to go for. Heh. In this book, a little girl is going on a train ride and it emphasizes the difference between riding on at train in the daylight and in darkness (particular when going through tunnels). The girl falls asleep on the train and has an interesting dream about little dwarf like people. Given that there were no words and I was making it up as I went along, this was a little strange and hard to explain. However, I suppose it appeals to the imagination. Maybe I just don't know what to do with these types of books! The winner for me (and Bookworm1) was That's Not My Train which is an Usborne touchy-feely book. The wheels of the train are too slippery, the windows too shiny, the roof is too rough until you get to the perfect train - the one with the glossy engine! These books are perfect for little fingers. (We also loved and reviewed That's Not My Plane which was a huge hit.) I love these books and was glad to see that our local library had a few - and specifically the one about trains! Of course, we can't post about trains without posting about Thomas! If you have never picked up a Thomas book, a good place to start is Thomas the Really Useful Engine . This book is one of our favorites and given my experimentations apart from Thomas, I'm inclined to say I'm going to camp out on Thomas. However, if you have a good book on trains that you think we'd enjoy, by all means leave a comment and let me know about it! Speaking of Thomas, I know there are hundreds of young fans out there. Surely you've seen Briarpatch Thomas games. Well, we had but I wasn't very sure how well they'd go over around here. Sure, it's Thomas but . . . are they fun? 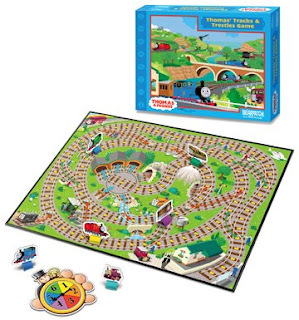 Well, we can assure you that the Thomas and Friends Tracks and Trestles game IS fun! The best way that I can explain it is by saying that it is something of a glorified version of Chutes and Ladders - except there are no chutes and there are no ladders and there aren't any numbers on the board. Instead of your train character of choice moves along the tracks and meets with the possibility of sliding on up the track towards Tidmouth Sheds or being waylaid by any number of wacky freight cars. It helps children in their counting and gaming skills. The bonus is that one of the characters that you can choose to be is Harvey and since Harvey is not a part of our home train collection, he was a nice little gaming addition! Seriously though, this game was fun and if you have a Thomas fan in your possession, you might want to consider this game. Mommy liked it for its simplicity, while still being interesting. Ok so your turn to suggest! What do you have in the way of trains for us? Do tell! That train museum sounds fascinating, though. About a year and a half ago, we took a train trip and visited a museum. It was lots of fun! Yay for you going to the library to get more train books! : ) The Usborne one especially sounds like fun. I really need to look into those! We also went through the train stage. My son is now 7 and I'm pretty sure we'll still have the Thomas table when he graduates from high school! Hhaa, my brother was OBSESSED with Thomas. Loved this post! We totally bypassed the whole Thomas / train deal. Perhaps it is a recent phenomenon? Actually, for my oldest son, it was Barney. I'm thinking Thomas is the better deal, but that's just me. All that to say: your little one is adorable. Great pics! Oh fun. As you know, we still love Thomas (although it seems to be waning a bit, which makes me sort of sad). We have quite a few nice puzzles from Ravenspatch.